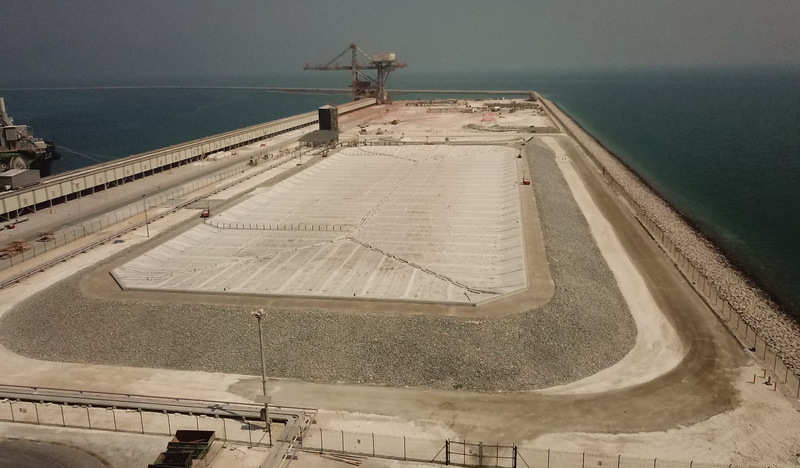 Red Earth Engineering (REE) was engaged by the Bechtel Petrofac Joint Venture (BPJV) to design and provide construction quality oversight for the Al Taweelah Alumina Raw Caustic Bladder on the Emirates Global Aluminium (EGA) site located north of Abu Dhabi, United Arab Emirates. The floor liner system and floating cover design were complex and required immersion testing of candidate geomembranes. Immersion testing involves the incubation of geomembrane samples in synthetic or actual field liquids at different temperatures to accelerate their ageing. The data can be used to establish a time-temperature superposition model, namely an Arrhenius model to extrapolate a selected property at a site specific or range of temperatures. REE have developed state of the art calculation methods for the floating cover given the complex interactions and induced stresses from fluctuating raw caustic levels and environmental loads (e.g. wind, UV, heat etc..). Last year saw the culmination of our design and construction oversight efforts with the first raw caustic delivery via ship being pumped into the caustic bladder. Following pre-commissioning activities, which included hydrotesting with seawater to full supply level, we were very pleased to hear from BPJV and EGA that no leakage was being reported as at December 2018.